Who: VI-East Panthers (18-6) vs. X-Harrisville Pirates (22-3). What: New York State Public High Schools Athletic Association Tournament final four. When: 9:30 a.m. Friday at the Floyd L. Maines Memorial Arena in Binghamton. NYS Sportswriters Rankings: East is ranked No. 2 in the state. Harrisville is ranked No. 4. 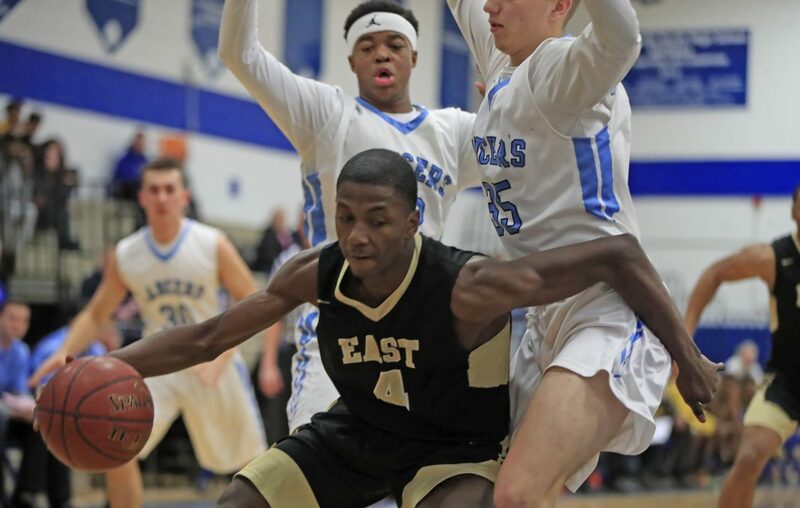 How they got here: East, which won its first sectional title since 2015, advanced to its first state semifinal since 2008 by defeating Section V champion Clyde-Savannah, 72-56, in last Saturday's Far West Regional/state quarterfinal game at Buffalo State Sports Arena. The Panthers used a 22-9 fourth quarter to pull away from Clyde in a game that featured 10 lead changes. Willard Anderson and Justin Allen each scored 27 points in the victory. East's defense limited the Golden Eagles to just three field goals over the final eight minutes and 19-for-56 shooting overall (33.9 percent). The Panthers also held a nearly two-to-one edge in rebounding (52-27) led by Allen's 20 boards (including 10 offensive). Harrisville advanced to its second-straight final four by defeating Section III champion McGraw, 66-55. Peyton Schmitt scored 10 of his 18 points during the final eight minutes to lead the Pirates, who are making their fifth state semifinal appearance. They made 14 of 18 free throws in the second half. Five Harrisville players scored at least seven points in the win with three in double figures. The Pirates lost in double overtime to Newfield, 65-62, in last year's state semifinal. East key players: Senior Waunya Shaw, 6-3 (14.1 ppg. 7.0 rpg. ); senior Willard Anderson, 6-2 (25.7 ppg., 6.1 rpg. ); senior Justin Allen, 6-5 (15.3 ppg., 13.0 rpg. ); sophomore Danny Carter, 5-10 (6.1 ppg., 3.3 rpg. ); and senior Jahahd Maryon, 6-1 (10.1 ppg., 3.1 rpg). Next: The winner advances to Saturday afternoon's championship game at 5:15 p.m. against either IV-Newfield (21-2) or defending state champion VII-Moriah (24-0).